The video below sheds light on a heart-rending situation of the radioactive puppies and dogs of Chernobyl. In 1986 there was an explosion at the Chernobyl nuclear power plant in the northern Ukraine. People were immediately forced to evacuate the surrounding area and many left their pets behind. The people thought that they’d be able to return in a few days to get their pets. Instead, soldiers were ordered to shoot the abandoned animals. But some of the pets survived and now hundreds of dogs and puppies that live in the area around Chernobyl are believed to be their descendants. These dogs are true survivors. “Puppies of Chernobyl” is a short documentary by filmmaker Drew Scanlon. The video shows a series of adorable puppies and dogs in Chernobyl’s exclusion zone — a 1,000-square-mile area around the nuclear plant where access is strictly limited. 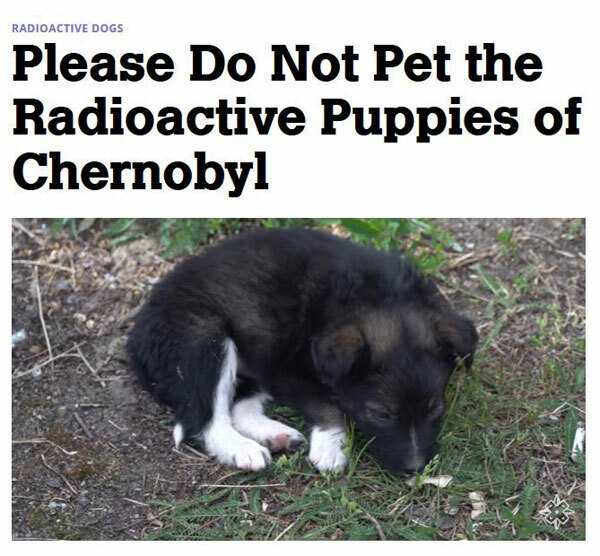 Visitors were originally told not to pet the puppies because their fur might contain radioactive particles. How do you not pet these adorable puppies? This has changed. Visitors are now petting the puppies and also taking care of them. See the video below for more information. The Clean Futures Funds Brings Hope To The Puppies of Chernobyl – Watch the Video! The Clean Futures Funds, a nonprofit, is spearheading a five-year plan to spay and neuter the dogs and cats roaming in the area, then set up food and water stations and a veterinary clinic to help care for the animals. Learn more about these dogs at Dogs of Chernobyl. The 142nd Annual Westminster Kennel Club Dog Show just took place this week. On the Jimmy Kimmel show they decided to remove the dogs. While they love the dogs, they are also amused by the humans who participate in this. Watch the video of the Westminster Dog Show Without Dogs.